Free patterns and printables for making paper crafts, arts and crafts decorations and gifts to make at home or school for every month of the year. Holiday printables, birthday party crafts, decorations, greeting cards, stickers and iron ons are just a few of the free crafts you'll find in this section. Printables for all the special holidays from New Year's Day to Kwanzaa plus unique budget-friendly ideas for easy gifts and decorations to craft for any occasion. 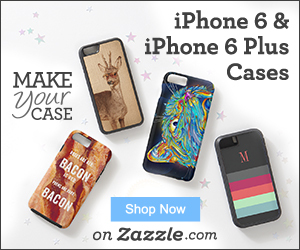 Crafts for kids and crafts for adults - crafts for everyone. 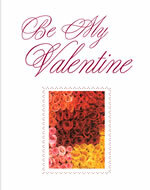 Free printable Valentine's Day Greeting Cards, romantic design note cards (2 per page) with inside blank for your special message. 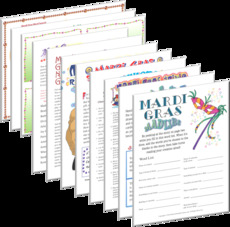 Enjoy the days of Carnival between Epiphany and Lenten season with fun and free Mardi Gras holiday printables. Make some playful St. Patrick's Day cards, decorations, buttons, corsages or gift tags to celebrate March 17 in Irish style using free Irish clip art. Create a tee shirt, tote bag or banner from printable iron ons with Irish motifs. Little kids can have fun with free St. Patrick's Day Coloring Book sheets or St. Pat's cards to color and cut out. Print and cut stickers do double duty as party picks to decorate appetizers, sandwiches or cupcakes. Click here for Party Pick instructions. 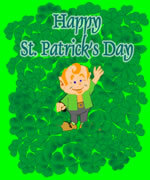 Fun and free printable paper crafts and St. Patrick's Day clip art. Easy Easter crafts for the whole family. 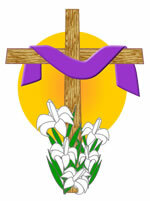 Easter Cards - Print and color an Easter coloring card or print full color Easter greeting cards for friends and family. Mini cards are ideal as gift tags, too! 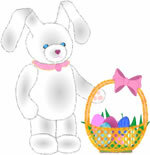 Easter baskets - tuck in some free Easter gift coupons! Print, cut and fold Easter place cards for Easter brunch or the dinner table. Decorate colorful Easter Eggs - print a whole sheet of fresh eggs waiting for colorful designs, stickers and markers. Glue them to a coloring flowering tree to make an Easter Tree poster. Make more Easter decorations for home and holiday from free clip art and paper craft printables. Lovely gifts, crafts and cards for Mother's Day. Print a sheet of labels for Mom's books or to label jars, boxes and folders. Make a batch of bath salts and add a label to the jar. Give Mom or Grandma a love coupon for Mother's Day - add your own special gift promise. Print and cut a rose-covered bookmark for Mom, and a lovely purple iris bookmark for Grandmother. If you have the world's nicest grandmother, or step mom, or mother, let everyone know (and her, too!) with a full-page award certificate for Mother's Day. Little ones can color a greeting card to give Mom for Mother's Day. 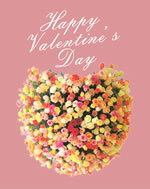 Design your own cards, gift tags, signs or bookmarks with free clip art and quote graphics. Make something special for Dad, uncle or Grandfather on Father's Day. Get ready to craft Dad, Grandfather or Step Dad a card or gift for Father's Day! We have lots of free printables and craft resources for Dad, Grandfather, Uncle or Step Dad gifts. 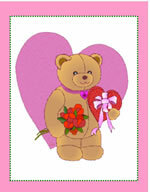 You can even design your own cards and gifts with free Father's Day clip art and coloring pages. Print and color in a cool poster sign that says Dad You're Awesome. Print and cut a set of new bookmarks for Dad or Grandpa for Father's Day. Give the little ones a tie picture or blue jeans poster to color and decorate. Or, print a special Father's Day card or World's Best award certificate for father, uncle or grandfather. If you want to give Dad an IOU for a special gift you can't wrap, or one you haven't got ready yet, print some free Father's Day IOU coupons. 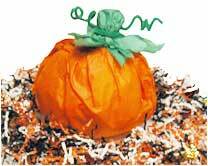 Craft these cute paper pumpkins to hold Halloween party candy favors deep inside! Trace a plate or cake pan on two squares of orange tissue paper stacked together and cut out..
Place candies in center of the sheet stack and gather the top together, then neatly twist to form a ball shape. Twist slightly to form stem, and tape the stem tightly closed. Cut two smaller square pieces of green tissue paper and stack with corners askew. Place center of the green papers over stem shape, gather and twist slightly, then fasten with a green fuzzy stick as shown in photo. Pattern/instructions originally found at Candy, USA (National Confectioners Association site). 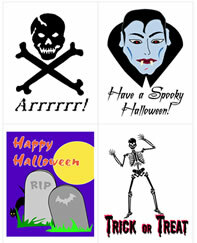 Four fun cards on a sheet - make fun Halloween cards or labels or gift tags. Free printables! Check out all the funtastic Halloween printables we've got ready for you. 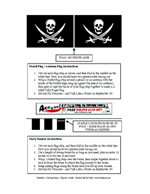 Pirate Flag Cupcake Picks - Pirate flag miniatures for desk, antenna, table top, cake decorations or party banner decorations - complete with instructions. Dress Up the Table with Thanksgiving Place Cards - turkeys or oak leaves, lovely placecards ready for you to add each Thanksgiving guest's name. Send a harvest greeting card with turkeys, autumn leaves, pumpkins or other seasonal pictures. Crafts for the December holidays are all here and ready for free download. Angel Swag Craft - make a decorative garland of angels for your doorway, windows, mantel, bulletin board or Christmas Tree. Iron On Transfers - make tee shirts, gift bags, totes and banners with free ready to print Christmas iron on transfer designs. Holiday Papers - to write letters, design menus and greeting cards. Use these cheery free printable papers for gift wrap, gift tags and scrapbook page layouts, too. Give the little ones a tree-shaped paper with lines to write to a letter to Santa they can color and decorate. Gift Tags - print a sheet of free gift tags with lovely seasonal designs for Hanukkah or Christmas. Christmas Holiday Bookmarks - print and cut bookmarks for quick gifts, unique cards or use them as jumbo gift tags. Ornaments to Color - gingerbread boys and girls, 6 on a sheet! Free Trials, Samples, Software, Coffee, Clip Art, Printables, MORE! 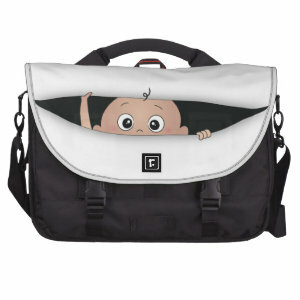 Iron On Transfers - these cool graphics are ready to print and iron on! 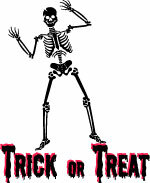 You can make tee shirts, banners, patches, bags, decorations and flags with Christmas graphics, Halloween designs, Patriotic graphics, Pirate iron ons, flag iron ons (USA, Canada, Australia, Ireland), Baby Iron Ons, Wedding Iron ons and lots of fun images in this collection of free printable iron-on transfers. "My Family" Photo Poster Project - scrapbook page or poster. Hawaiian Lei Paper Flower Necklace - full color, or color and craft. Masks: Print, cut and decorate fun and fancy masks for Mardi Gras, Halloween, or masquerade. Full color printables, and ready to color masks. Clip Art: seasonal and themed graphics for crafts, cards, scrapbooking, decorating, blogs/web pages, iron ons, party favors, creative projects. Stickers - pirates, autumn, bus tags, note tags, pets, more!